Alright, so...some of you have said things like, "wow, I am so impressed"..." or "I want to do that, I just don't know how"....about my chair. So, I already told you I took pictures along the way, I just never posted them. Now is the time- to unveil the secret....it really isn't as hard as it looks! I'm serious! As long as you have the right tools, which would be: a)flat head screw driver; b)staple gun; c)fabric; d)a desire to have an awesome looking chair in your living room. If you look at the bottom left picture, of the collage above, you'll see us taking out nails...this was HARD and REALLY annoying. 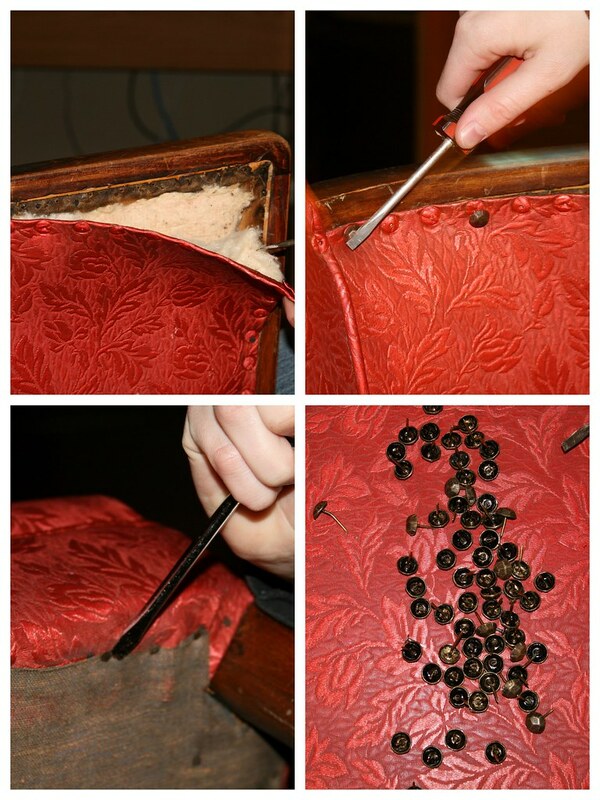 In all the spots they didn't have decorative tacs, which was basically the majority of the chair...were NAILS! We could've just taken hold of the fabric, and pulled...but then the fabric would rip...and we wanted to use the fabric for a pattern. Certain spots like the legs...were done certain ways...like, folded under in one spot, tucked in another...you know. So we had to take note to make sure we did it the same way. K- I kid you not- the inside of this chair was NASTY! It had food and toothpicks and coins CAKED on. So gross. So of course, the next step was to vaccuum out all that disgustingness. Next, I didn't take pictures of this part (should have! ), but we unpicked the piece where your back rests, so that we could get a real dimension of what those pieces are before the piping is sewn in. 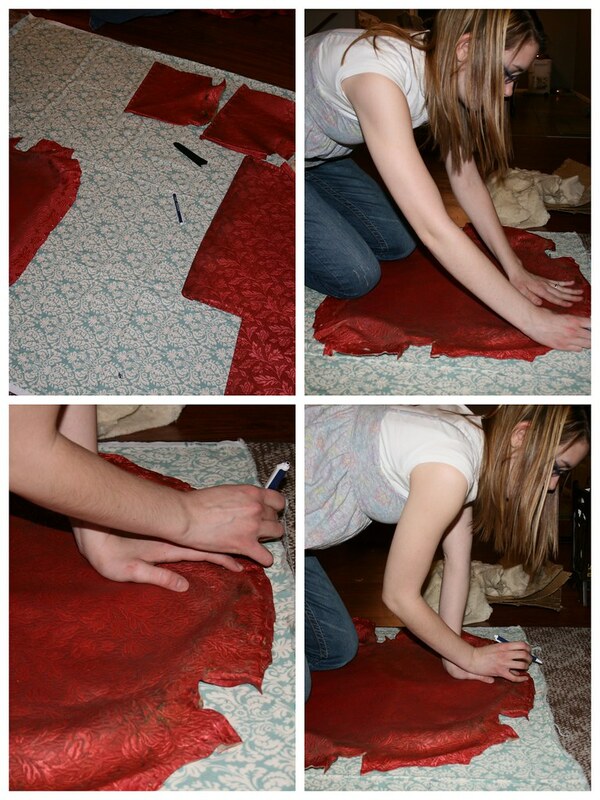 Then we laid out all the pieces we carefully took off, onto my beautiful fabric. We honestly traced the pieces with a pen. I wish I had a permanent marker, but I didn't- otherwise I would've done that. It doesn't matter because all the edges are tucked in the chair- so who cares if you see markings? Not I! Then we carefully cut out the pieces...and I sewed my piping. If you don't know how to do piping- it's super simple. Google it or something. I will do a tutorial later on that maybe when I do my second chair. 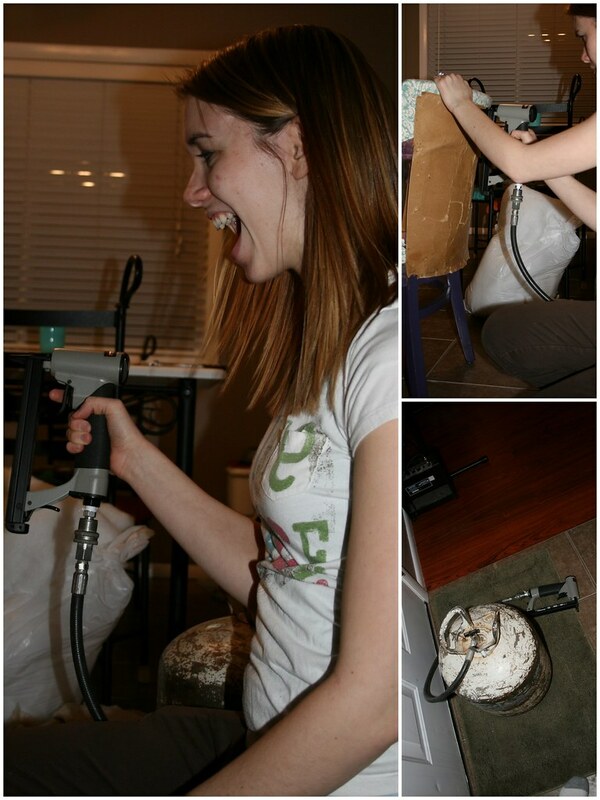 Then...we used a friggin SAWEET staple gun that Patty & Paul lent us, which is powered by air...and it was P-O-W-E-R-F-U-L! The boys (Kurt & Clay) kept saying, "Don't hurt each other", "Be Careful", "blah balhbalhlahblah". We did just fine:) Anyway, we basically put it back together like so: the LAST piece we took of the chair, was the FIRST to go back on. The FIRST piece we took of the chair, was the LAST to go on. You see? You just go backwards. So, after we did all the stapling, it was time to put on the pieces that were held together by the decorative tacs. I didn't take pictures of this...but a tip we have is, use the same holes they came out of! Makes it so much easier. 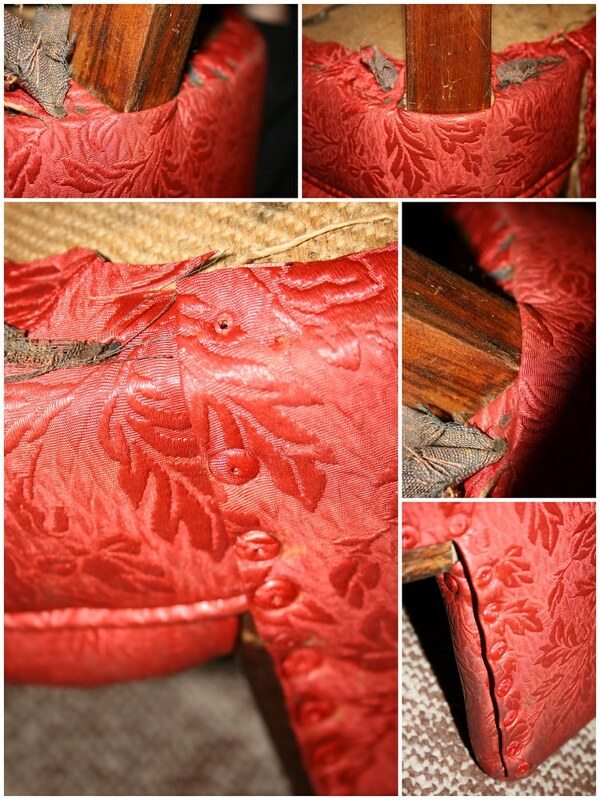 Lori pretty much did this entire job on the chair, and she found that if she pulled the fabric back, poked around the wood and found the hole, it was way easier to put through the fabric and into the chair. A few times we couldn't find a hole, so we had to nail it in- which was HARD TO DO! But, we managed. 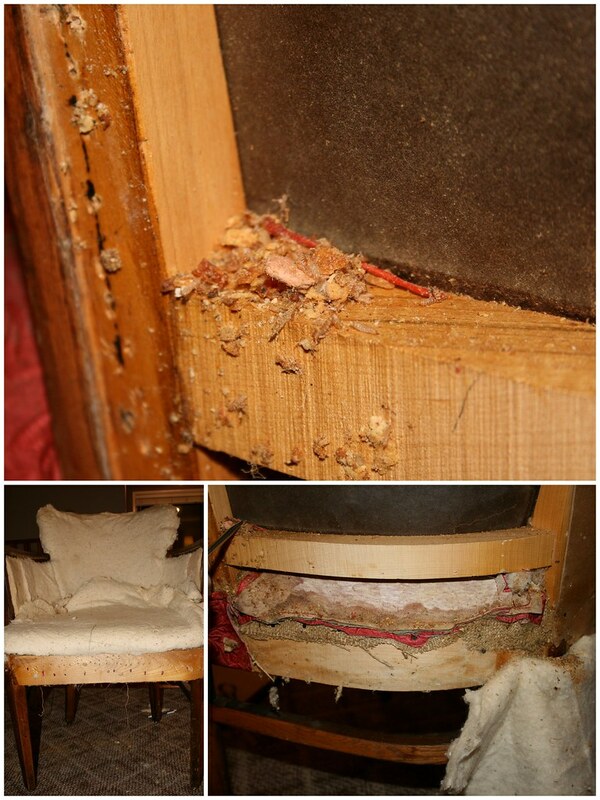 Fabreeze the inside of the chair if you are using that batting- I did, and could no longer smell anything:) Gross you out? I spray painted the legs and arms....purple. I did this after all the old fabric was taken off, and before the new was on. I didn't even remove the batting...it didn't matter if it got some spray paint on. If you don't like the look of bright colored wood, or painted wood, re-stain it! Reuse the decorative tacs. Why go spend a bum-load of money when you have perfectly good tacs from the old chair? And with that, you'll have this gorgeous chair! After you reupholster something, you will think of all sorts of things you want to reupholster. You will love it. DO IT! I saw this on Better After. Nice job! I love the fabric and have been looking for something similar. Where did you get it from? What's the name or designer? This is phenomenal! I found you from Better After. Love it! Hey thanks guys! Ummm...unfortunately I have NO IDEA what the name of the designer is of this fabric. I got it from Home Fabrics about...eh...a YEAR ago. So I really have no idea if any of the stores still have it- I know mine in Idaho Falls doesn't! Good luck! I too am from Better After..I just found a pretty 'saweet' antique chair on the side of the road and have been thinking and re-thinking of how I am going to re-cover it. Thanks for the detailed pics/description!! Visiting from Better After -- that chair turned out beautifully! I saw you on Better After -- and this chair is just AMAZING! 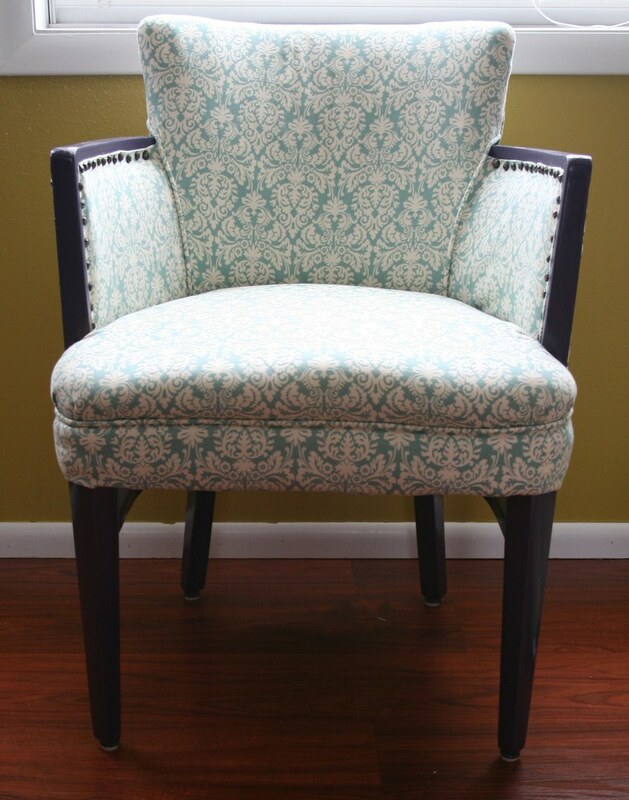 Thank you so much for the awesome tutorial -- I've been wanting to do a chair redo like this one but not sure where to start. You did a wonderful job! I am amazed when people can do this cause I wouldn't be able to piece it all back together. Wonderful job! I love it! You make me want to reupholster a chair. I don't even need a chair! It looks like a fun project though. =) Your chair turned out wonderful! I like the lost cushion chair too. I've tackled all kinds of jobs..refinishing floors, laying tiles, demolishing, rebuilding, but I never thought I would EVER attempt this kind of project. But you really did make it seem do-able. I've passed up so many great chairs because of my fear of messing up the recovering. Thanks to you, I am definitely going to give it a shot!